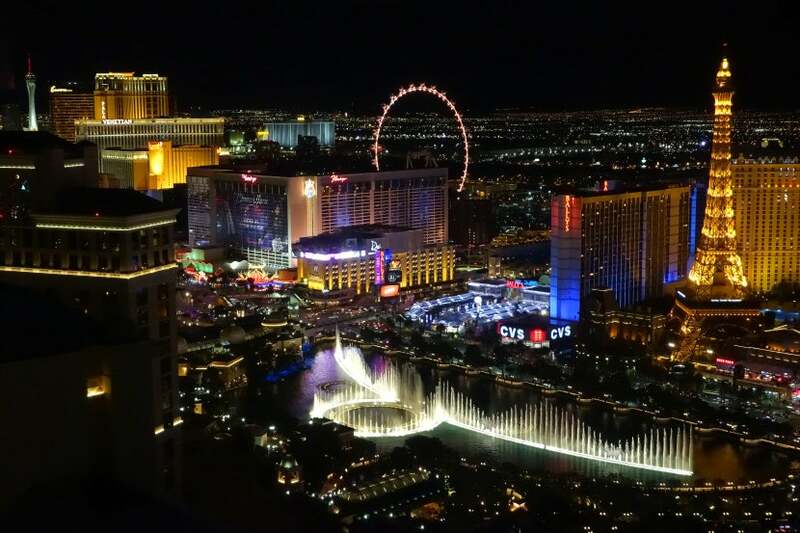 On a recent trip to Sin City for Vegas Uncork’d, TPG Editor-in-Chief Zach Honig had an opportunity to stay at (and review) a Studio Fountain View Suite at Vdara, an MLife/Hyatt partner hotel. There’s no shortage of high-end hotels in Las Vegas, and with new partnerships making it easy to earn and redeem with Hyatt and Starwood — not to mention plenty of opportunities to score even more perks through credit cards — it can be difficult to zero in on a property when planning an upcoming stay. 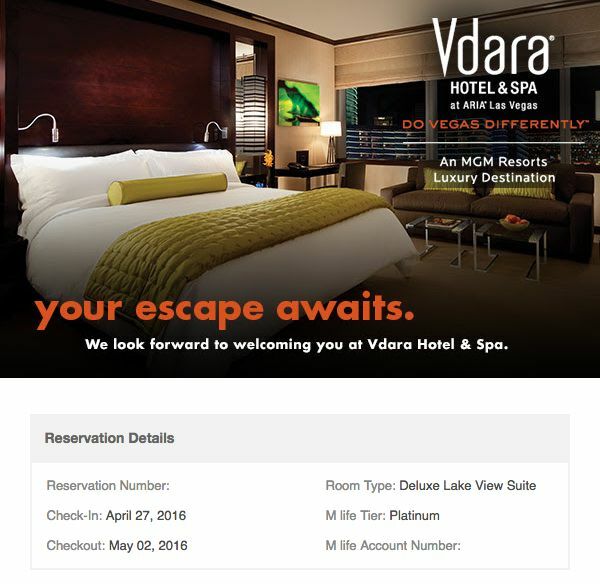 However, when it became clear that MLife stays count toward Hyatt’s fantastic spring promo, I decided to book a few nights at Vdara, where I was able to score a phenomenal rate (35% off) by signing into my MLife account and booking direct. One of my favorite things about Vegas is that you can score fantastic discounts just by joining a hotel/casino loyalty program. 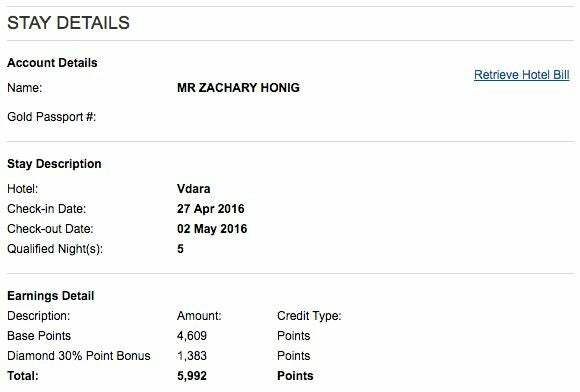 For Vdara, that means joining MLife and because I’m a Hyatt Diamond member, I was able to get instant Platinum status as well. Unfortunately even top-tier Noir members don’t get waived resort fees (as they do with Caesar’s Total Rewards program), but the rate was low enough that the $32 daily fee ($35.84 with tax) wasn’t the end of the world. 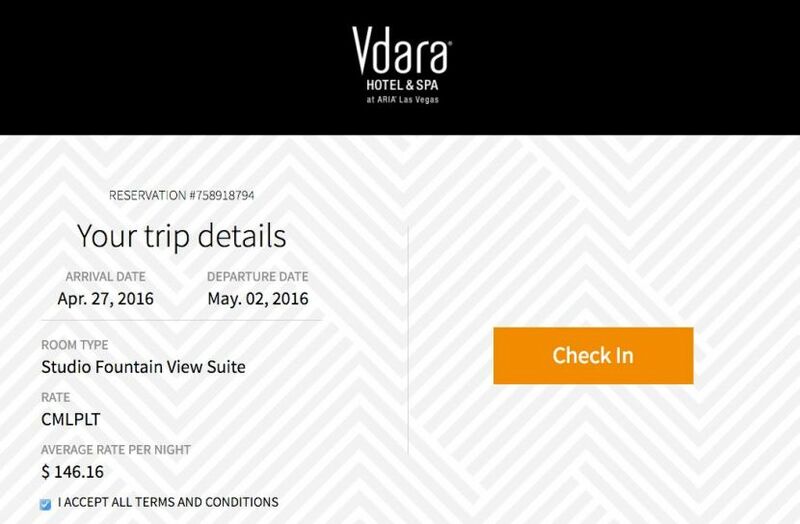 Note that most Vegas hotels charge a resort fee — at Vdara, this covers Wi-Fi, phone calls from the room, airline boarding pass printing, fitness center access and notary service (an absolute must for any trip to Vegas?). 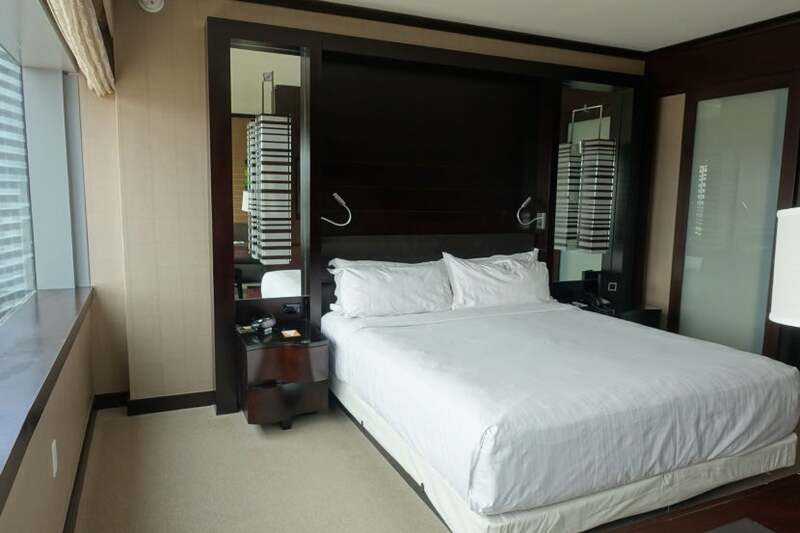 As an MLife Platinum member, my benefits are limited to an express line at check-in and the taxi stand at participating hotels, a “Platinum experience upon check-in,” room upgrades based on availability (nothing was available during my stay), 30% bonus MLife points, a buffet line pass and rental car discounts. The “Platinum experience” was probably the most valuable perk here, but I didn’t have the time (or interest) to take advantage. In this case, I had my pick of two tickets to one of the following: the Shark Reef at Mandalay Bay, the Bellagio Gallery of Fine Art, the Big Apple Roller Coaster at the New York-New York or Siegfried & Roy’s Secret Garden & Dolphin Habitat at The Mirage. Fortunately, I got a good deal on the hotel booking — the 35% discount was by far more valuable than any of the other outlined perks. My room during a peak period came to $105.70 per night, jumping to $191.10 on Friday night and $222.60 on Saturday night, before a 12% tax was added. Since I booked a five-night stay, normally I would have taken advantage of the 4th Night Free benefit with my Citi Prestige card, but the 35% discount (only available when logged into my MLife account) was more valuable here. I ended up paying with Citi Prestige anyway, though, since the card offers 3x points on hotel stays. 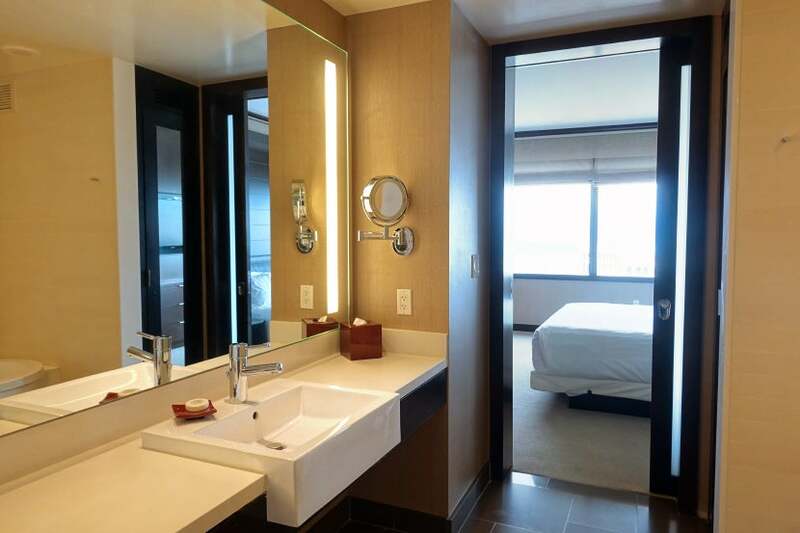 Note that you can book a Deluxe Suite (without the fountain view) for 20,000 Hyatt points, but considering how low the paid hotel rates are (and that you’ll still need to pay the resort fee on award stays), you’re probably much better off paying cash. 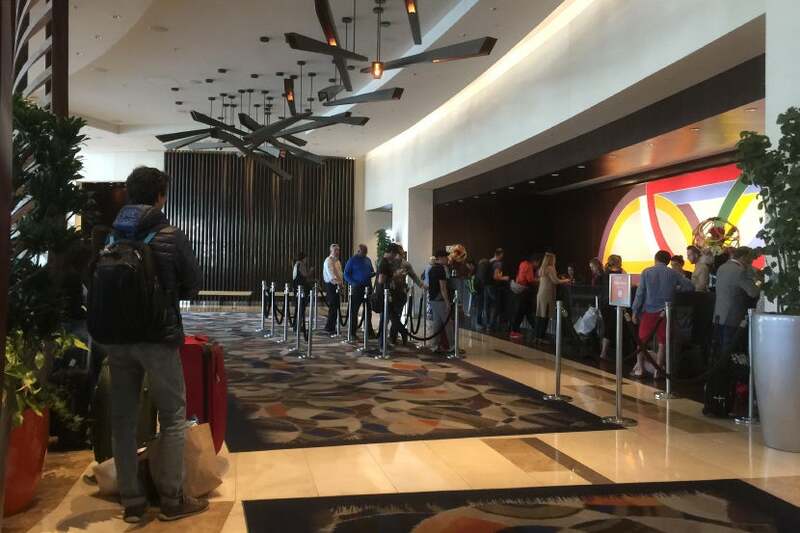 One of the most annoying things about Las Vegas (besides the insane airport cab lines) is the outrageously long check-in queues at hotels. 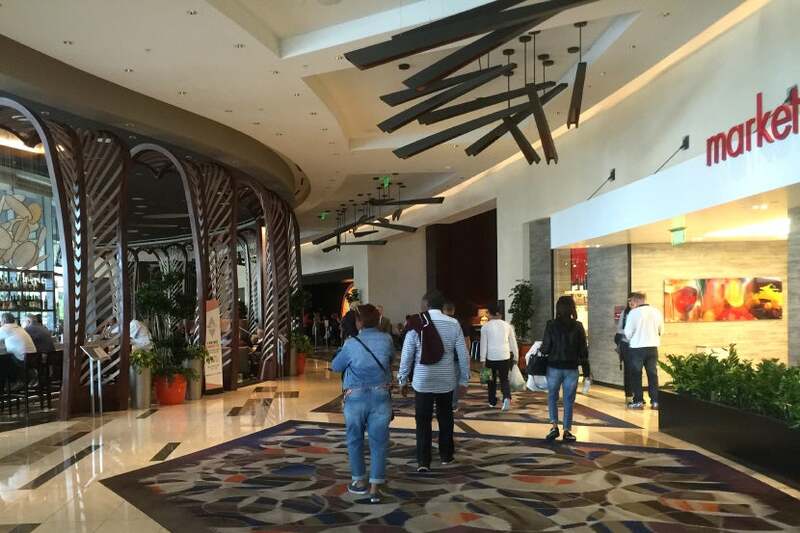 It’s not unheard of for guests to wait an hour or more when arriving during peak periods, and while the line at Vdara never appeared to approach anything you’d find at, say, the Bellagio, it certainly helps that Vdara offers online check-in. I received an email offering online check-in a day before my arrival. If you complete that process online, you can simply head directly to the key pick-up counter when you get there. I wanted to ask about Platinum upgrades, however, so I went to the dedicated “invited guests only” line (available to MLife elites). The main entrance hall was always fairly crowded. Vdara is located next to the Aria, but unlike its sister hotel, there isn’t a casino here. That means a bit less foot traffic, which can make a huge difference in Vegas — especially on Saturday and Sunday. Saturday check-in lines were manageable. As you can see, there wasn’t a long wait to check in even on a Saturday morning, when lines at other hotels can he frustratingly long. 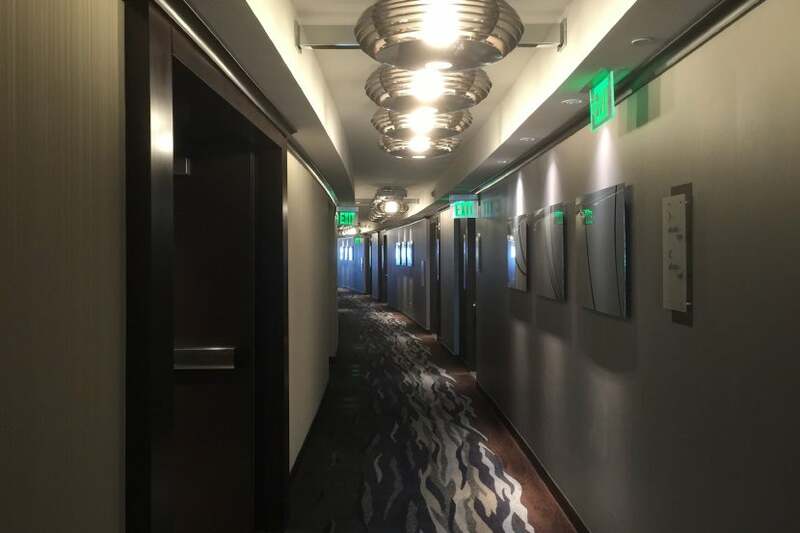 Vdara has just under 1,500 rooms and suites, which may sound like a lot, but that’s actually a fairly modest number when it comes to Vegas hotels. 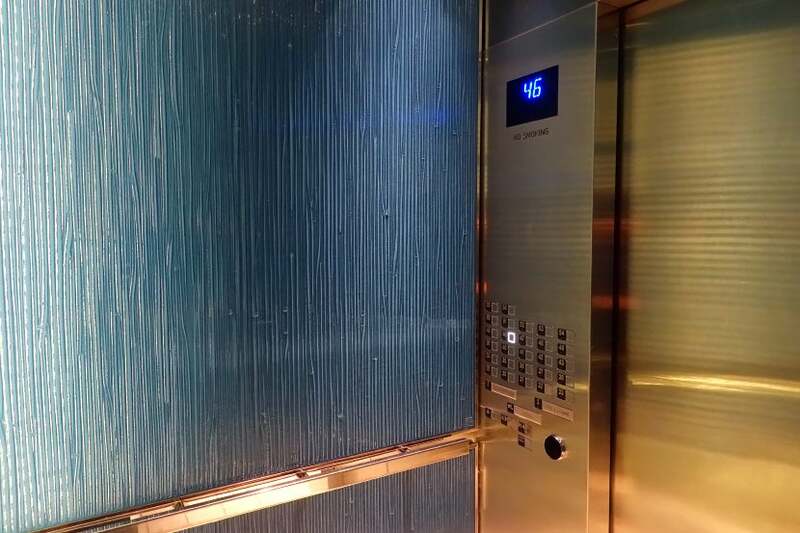 Going up to the 46th floor. 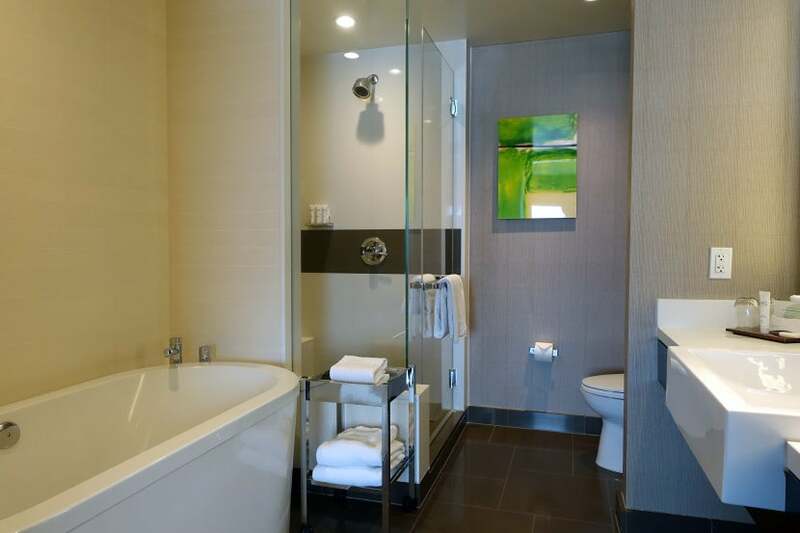 My check-in was processed swiftly and I was issued keys to 46028, a Studio Fountain View Suite (also referred to as a “Deluxe Lake View Suite”). A hallway on the 46th floor. 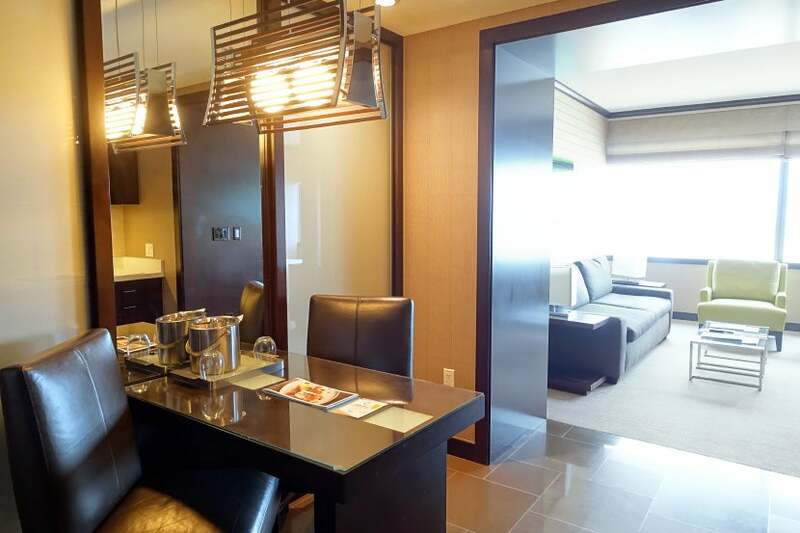 While Vdara is technically an “all suite” hotel, the Studio Suites are quite small by Vegas standards at just under 600 square feet. The studio had a small dining table. Just beyond the door, there was a small dining table with two chairs, an ice bucket and a couple of glasses. There was a small fridge with two water bottles. The “kitchen” (if you can call it that) had a mini-fridge with two bottles of water, a small cooktop, a sink and a microwave. 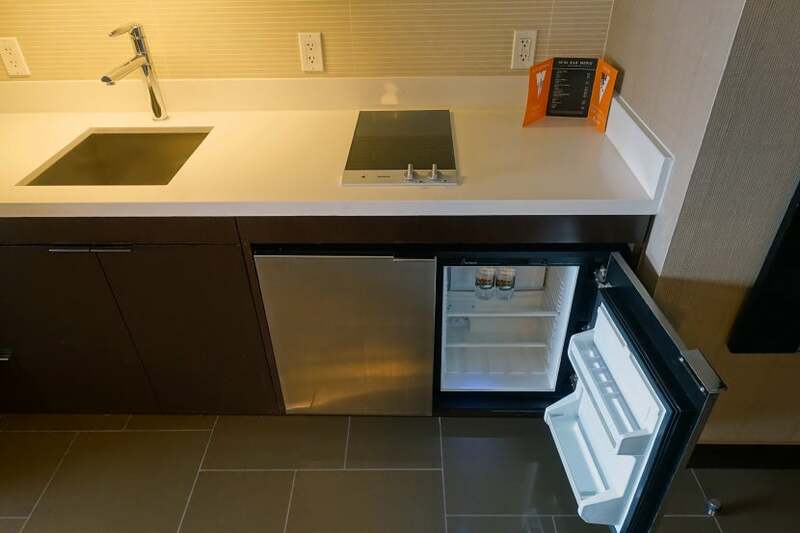 So theoretically you have everything you need to heat up your Vegas leftovers and save some money on an in-room meal. The living room area was a decent size. The suite had a living room area that was separated from the bedroom by a desk and television. The sofa was comfortable enough, but you probably didn’t come to Vegas to spend time in your mini-living room. While Vdara is fairly new, the furniture is beginning to show significant wear and tear, with lots of nicks and scuffs throughout the suite. Meanwhile, the other side of the room had a king-size bed, along with a couple of night tables, a phone, alarm clock and reading lamps. The closet was a decent size. 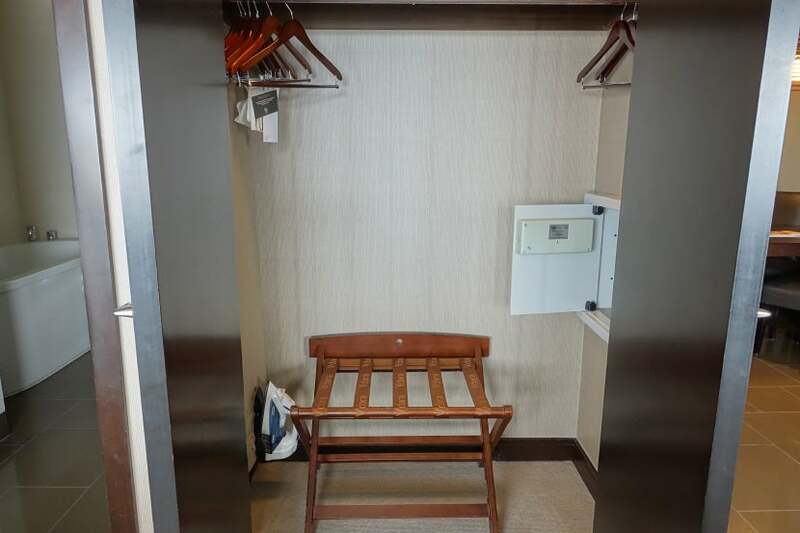 There was also a closet, with enough room to store a couple of small suitcases and a few hanging items. The view was pretty incredible. Of course, the highlight here was definitely the incredible view of the Bellagio fountains. You can’t hear the music, unfortunately, but the fountain show never got old. Definitely plan to spend some time watching the fountains at night! The nighttime show is even more fantastic! I found that the fountain schedule more or less matched what the Bellagio has listed on its site, though there was often a 1-2 minute delay before things got started. There was a separate bath and shower. The bathroom was clean and an adequate size, but it definitely lacked any character. The bathroom was fairly sterile-looking. There isn’t a window in the bathroom (as you’ll find in some Vegas suites), but the frosted door lets in plenty of light. There were a few bars of soap, a vanity kit and body lotion waiting near the sink. I received two body lotions but no liquid soap. Meanwhile, the shower had three other tubes of amenities, including shampoo, conditioner and another tube of body lotion. 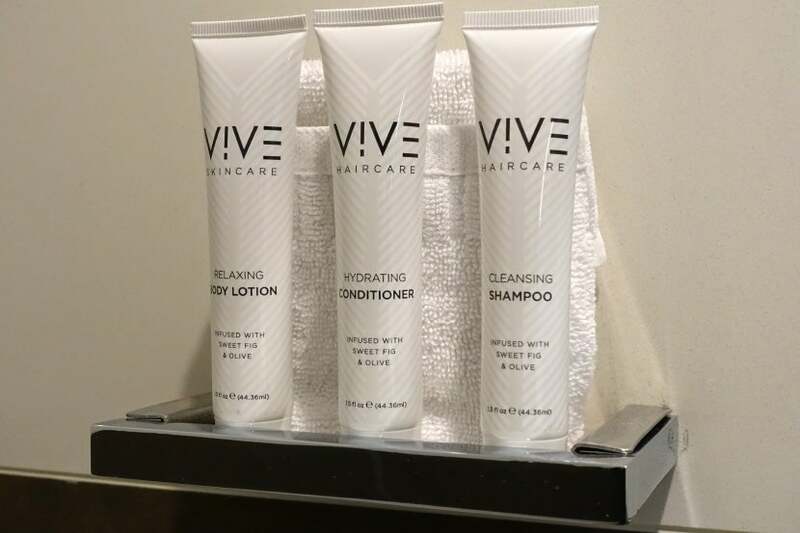 There wasn’t any liquid soap, unfortunately, and the housekeeping staff didn’t bring any at any point when cleaning the room during my five-night stay. 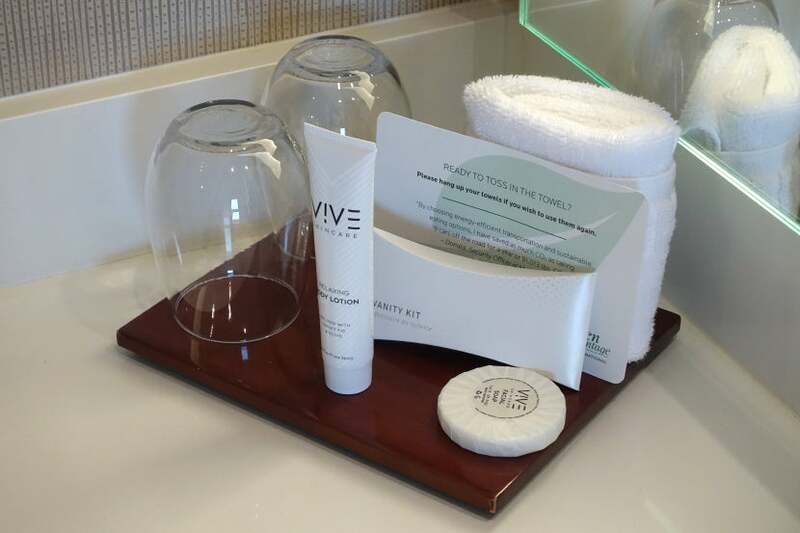 While Vegas guests may not spend very much time in their rooms, they do tend to experience several key hotel amenities. Wi-Fi performance was very good. Typically, Wi-Fi is the most important amenity for me, since I usually need to work quite a bit during any hotel stay. The $32 resort fee covers the cost of Wi-Fi, and while that’s a lot to pay if the only perk you’re using is in-room internet, performance was quite good in the suite. The hotel staff was always quick to pick up. 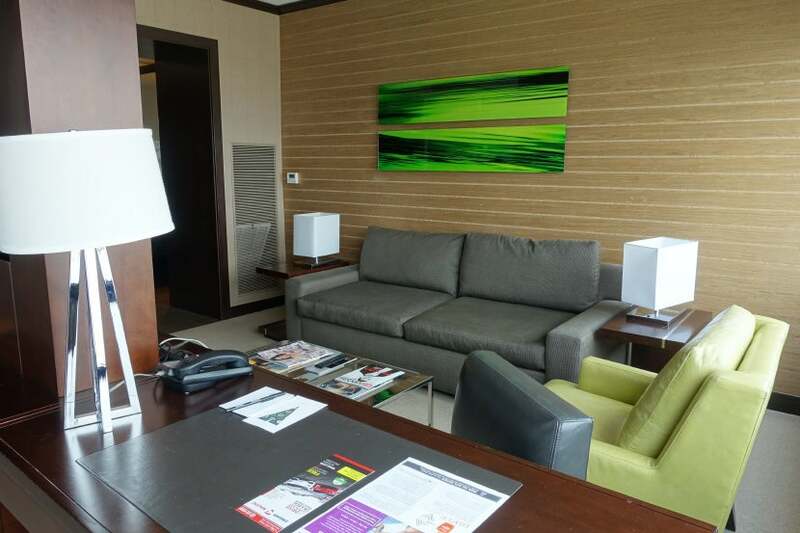 Unlike with TPG’s recent Nobu Hotel stay, the staff was very responsive at Vdara. 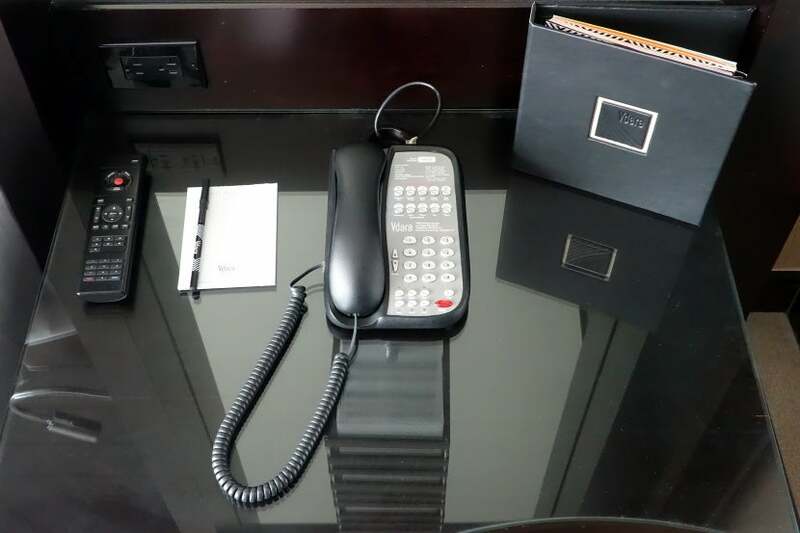 I called a few times, once to ask where to find the fitness center and another time to ask for maintenance to fix an issue with the toilet flushing continuously, which the hotel sorted out quickly. The room service selection was fairly decent. 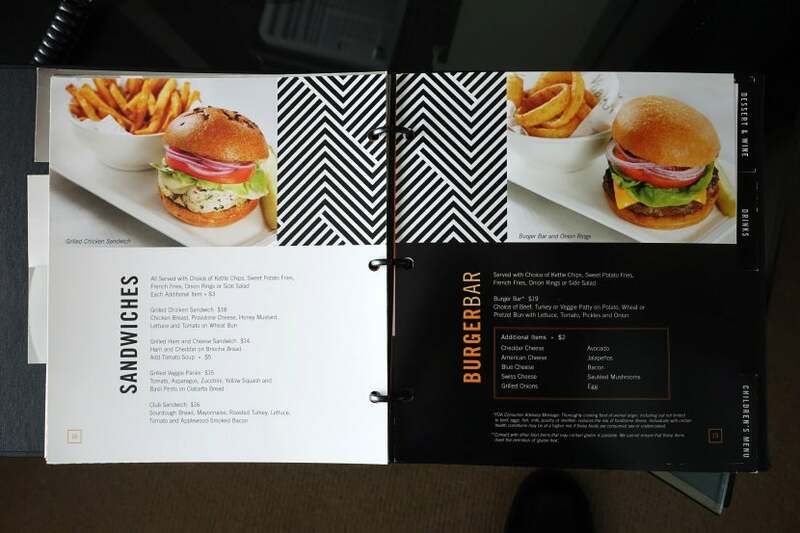 I didn’t have a chance to try out the room service, but prices were reasonable enough — $19 for a burger or $16 for a club sandwich. My “green glow” smoothie (x2). 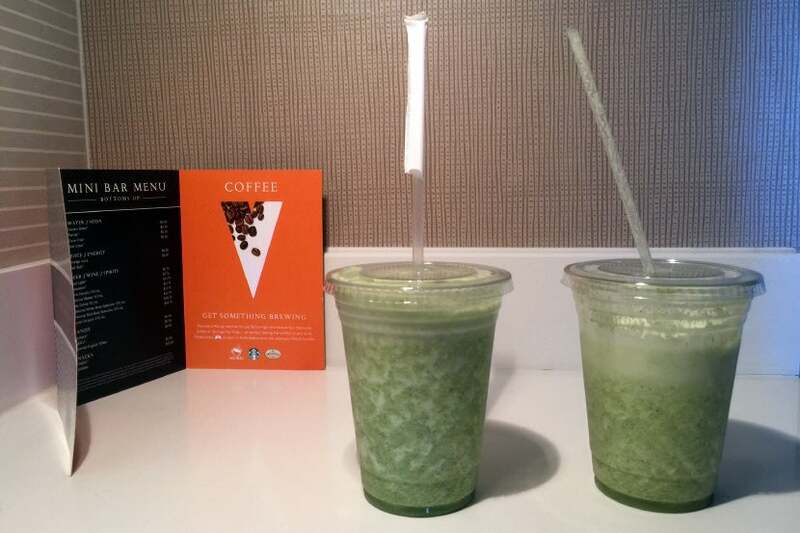 The only hotel F&B I managed to try was the “green glow” smoothie at the health bar located just outside the fitness center. My breakfast each morning consisted of a kale, celery and green apple smoothie with protein powder for $11. The staff always gave me a second cup with any leftovers, too. The pool was always packed. 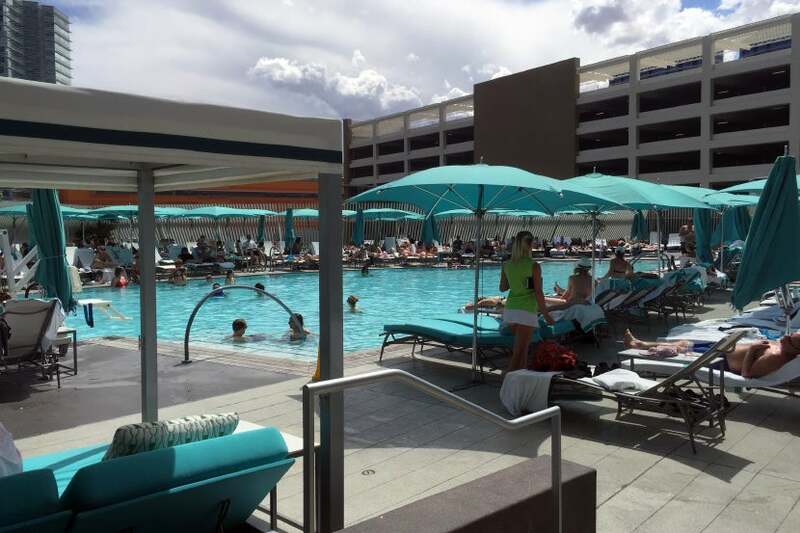 Vdara has one pool, and it seemed to be a very popular amenity. If you want a spot by the pool, be sure to mark your territory very early in the day! 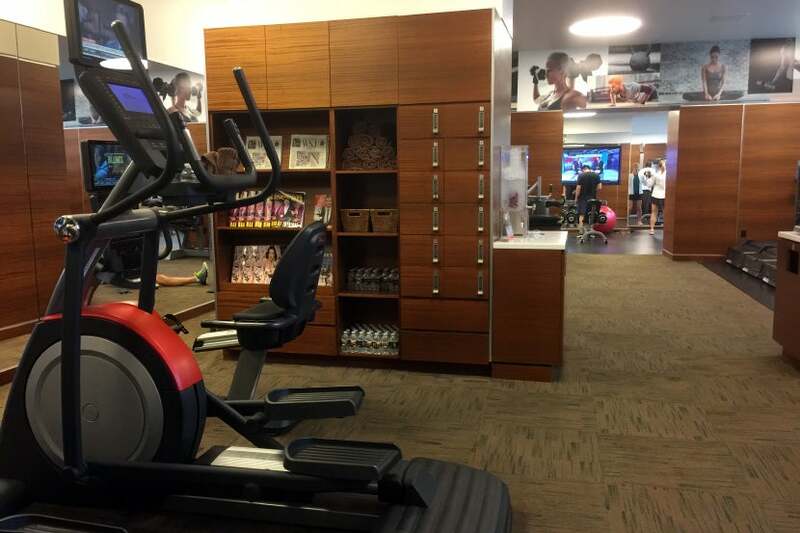 The gym was usually very crowded as well, but there’s a decent selection of equipment. Given all the amazing food we got to enjoy over the weekend, I spent a lot of time in the hotel gym. It was always fairly busy, but I didn’t have any issue grabbing one of the three elliptical machines. Like other hotels, Vdara has a dedicated ride share pickup area. 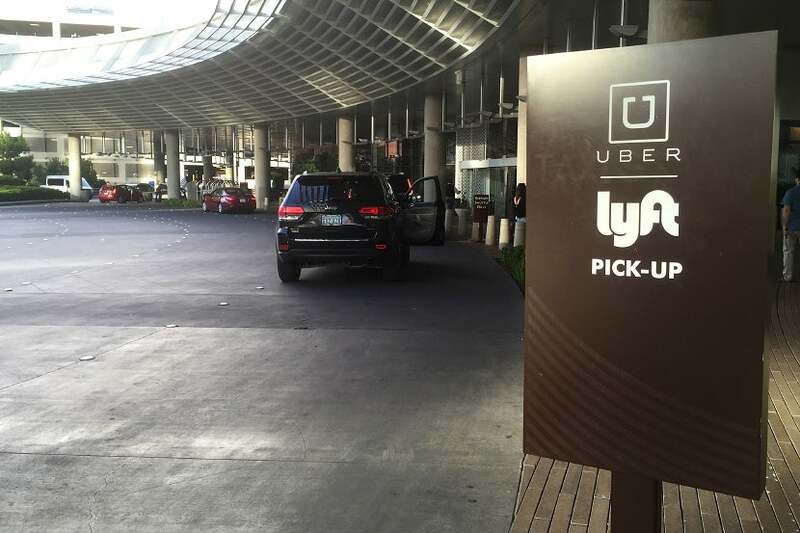 Finally, like other Vegas hotels, there’s a separate Uber/Lyft pick-up area at Vdara, located just a few feet from the taxi queue (which was never very long). Overall, I enjoyed my stay at Vdara. 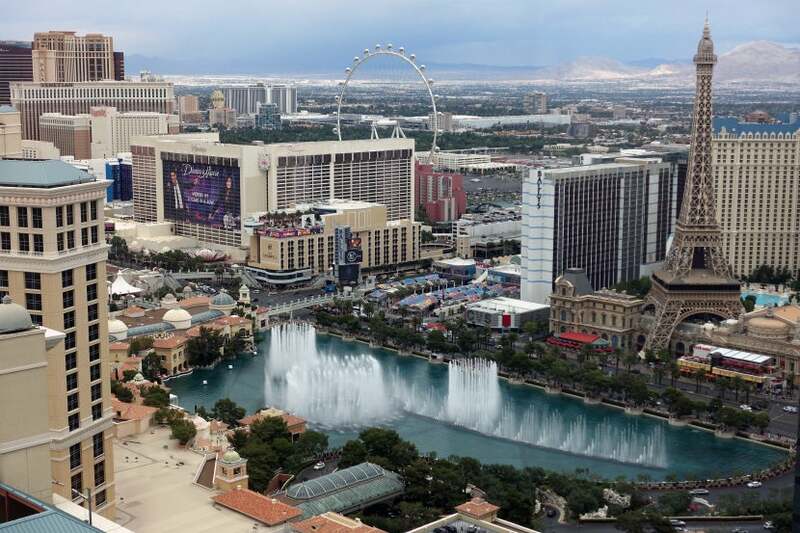 I wouldn’t recommend it if you’re after an incredible five-star Vegas adventure, but if you’re looking for a nice hotel with very reasonable rates (and the potential for an incredible view), this is definitely a solid option. Garbage was left in the hall for nearly a full day. 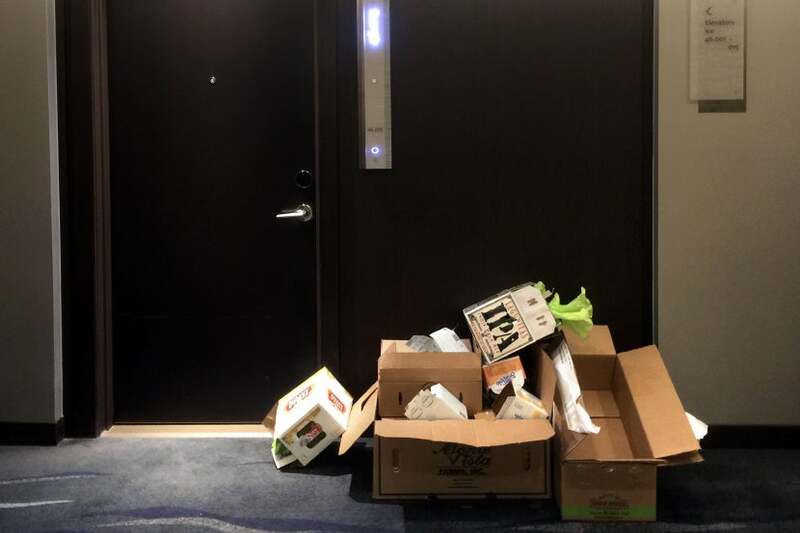 The hotel seems to lack attention to detail — for example this pile of garbage was sitting in the hallway right next to the elevators for nearly 24 hours — but the ability to earn 5 Hyatt points per dollar, plus my 30% Diamond bonus and even promotional points made it easier to overlook any shortcomings. Not only did I have a very good stay — I also walked away with 5 night credits and a total of 5,992 Hyatt points, worth nearly $108 based on TPG’s most recent valuations. 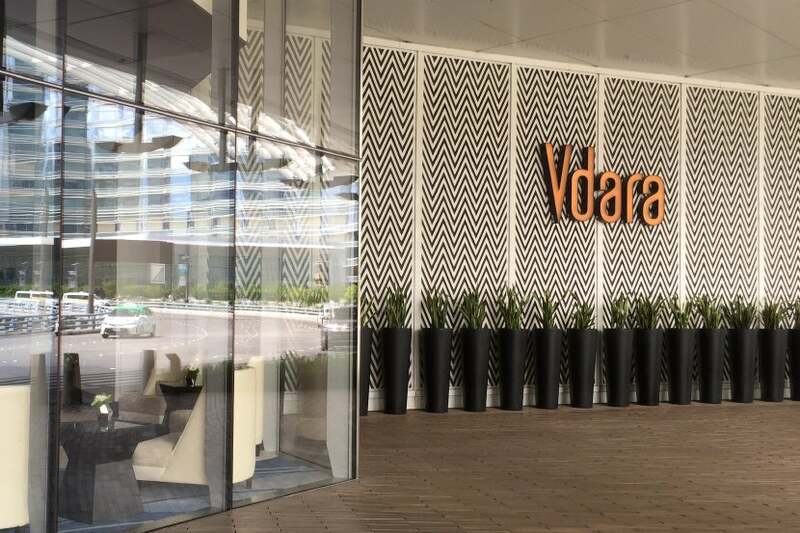 Have you stayed at Vdara? Tell us about your experience, below.